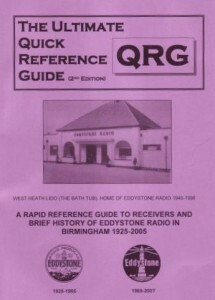 The first Edition of the Quick Reference Guide was produced in 1998 and covered receivers manufactured by the Eddystone Company frm 1946 to c 1969 (the “Golden Years”). It was intended to help members of the Eddystone User Group identify their areas of interest and further their knowledge of the marque. At the same time a short history is presented, especially for new members. Muc h of the information contained herein has been covered in greater detail over the past twelve years by the Lighthouse magazine and its predecessor the EUG newsletter. Something approaching 3000 A4 pages have been produced over this period.